GBA Postman Pat and the Greendale Rocket (Europe) "100%" in 28:30.1 by EgixBacon. 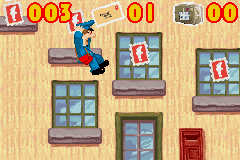 Postman Pat and the Greendale Rocket is a 2006 Game Boy Advance game based on the 2003 half-hour television special of the same name. The plot follows the eponymous postal worker as he embarks on an epic quest to save the Greendale railway from closure and get its flagship locomotive back on the tracks. This movie completes the game from beginning to end as fast as possible, while collecting all of the stamps, letters, and parcels scattered throughout the levels.